To make the crackers, you will need a mini food processor and ideally, a perforated baking tray, which provides a better bake for the crackers, making them satisfyingly crispy. If you don’t have a perforated baking tray you can substitute a normal one and the recipe will still work, but you may not get the crackers to have quite the same snap and evenness of bake. If you don’t have a mini food processor, you can chop the nuts very finely and mix the dough by hand. The reason for rolling the dough out under a sheet of clingfilm is because the dough is quite delicate before baking, so this part of the process helps prevent it sticking to the rolling pin or falling apart. I garnished mine with some pea shoots for a dash of colour, but this is optional. Pre-heat your fan oven to 170°C, and line a baking tray with baking parchment. Weigh all the dry ingredients into the bowl of a mini food processor and blend together. Add the oil and the cold water, and blitz to a crumbly dough. If the buckwheat flakes are particularly absorbent you may need to add a dash more water to bring the dough together, but do so sparingly. Remove the dough from the processor bowl and use your hands to press it into a lump of dough, and then place it on your lined baking tray. Cover the dough with a sheet of clingfilm to help hold the dough in place while you shape it, and press it out into a square shape. Using a rolling pin, finish rolling the dough into a neat square of roughly 30cm x 30cm (still with the clingfilm on top). Peel away the clingfilm and cut the dough into 16 crackers using a sharp knife. Prick the surface of each cracker a couple of times with a fork. Place the baking tray on the middle shelf of the oven for 20 mins. Remove from the oven, turn the crackers over and place them back on the baking tray, but this time without the parchment. Bake them for a further 5 minutes to dry the dough out. Remove from the oven and transfer to a wire rack to cool. These are best eaten on the day of making. 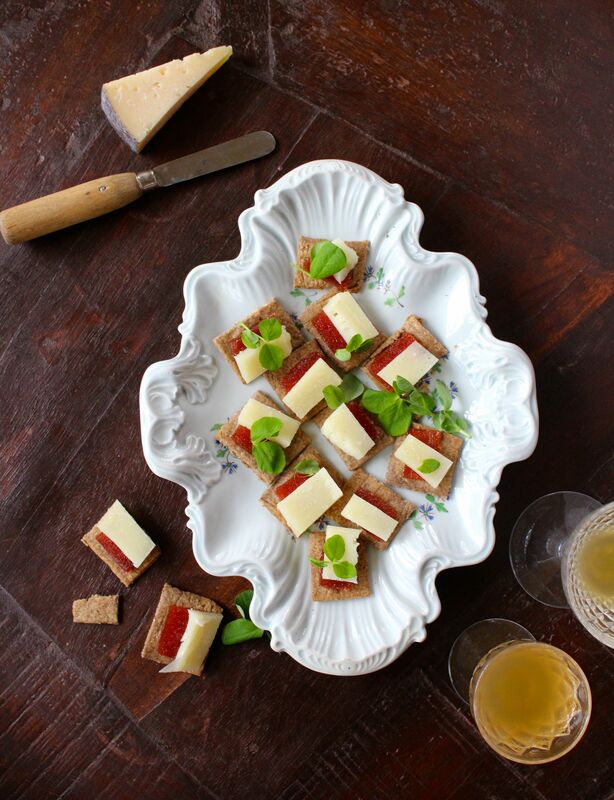 When you are ready to assemble your canapés, top each cracker with a slice of membrillo followed by manchego, garnish with pea shoots and serve.